The end of World War I brought a new sense of freedom and independence to women in the United States. It was during this decade that the “flapper” emerged, a new type of young American woman whose clothing screamed modernity. Prior to the 1920s, American women aimed to look older than their actual age, but with the implementation of the 19th Amendment in 1919, guaranteeing women’s suffrage, women began to strive to look younger and younger. Women began to wear looser fitting garments while hemlines rose to an unprecedented knee-length level, abandoning the more restricting and uncomfortable fashions of the preceding decades. American women of the 1920s often “bobbed”, or cut, their hair short to fit under the iconic cloche, a snug-fit hat made of felt that was worn tilted in order to cover the forehead and, at times, the ears. The flapper style dress and cloche hat were often worn together, particularly during the latter half of the decade. 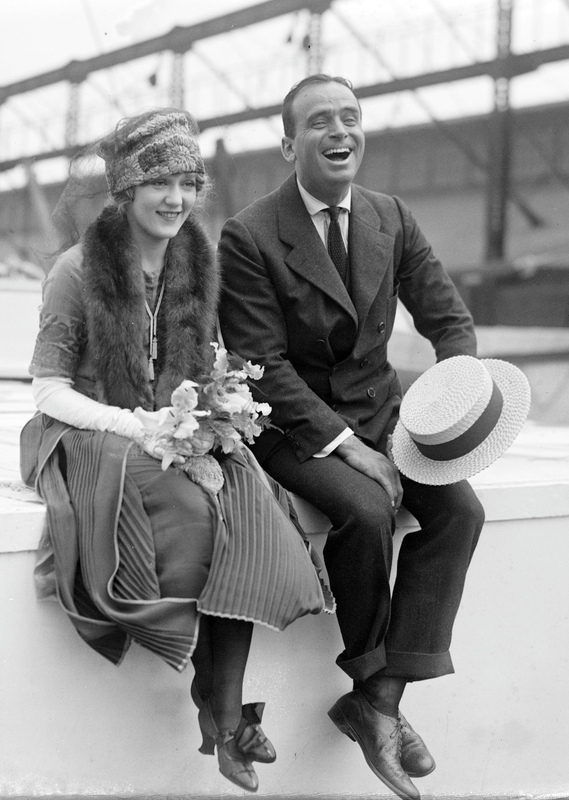 American men of the 1920s began to dress less formally than ever before. During the decade, men abandoned suit lapels of the 1910s, opting instead for cuffed trousers, flannel jackets, and two-toned shoes for casual wear. In addition, both men and young boys began wearing short knee pants, known in the U.S. as knickers, topped with lightweight sweaters and casual button-down shirts. Men’s shirts in the 1920s were often made of stripes in a mixture of colors, mainly pastel greens, blues, and yellows, contrasted with a white collar. Bow ties also rose to popularity during this era. Between the stock market crash of 1929 and the end of World War II in 1945, fashion trends were forced to take the backseat to more dire international concerns. But by the start of the 1950s, the fashion scene was yet again at the forefront of American culture, perhaps more so than ever before. The decade was marked by economic boom and a giant push towards consumerism, a trend that continues today. Once WWII came to an end, rationing became a thing of the past, as the availability and accessibility of several different types of fabrics became the norm. It was during this decade that department stores gained popularity across the country, providing Americans with access to a wide range of consumer goods. Women of the 1950s were expected to look and dress a certain way and many, for the most part, conformed to this newly established standard of beauty, unlike the fashion-forward, independent flappers of the Roaring 20s. As their husbands returned from war, the American women of the 1950s were expected to focus on their role as homemakers. Conformity among women was highly encouraged, eliminating the need for dramatically different styles. During this decade, hemlines dropped significantly, reaching mid-calf or even ankle length while the popularity of the hourglass silhouette rose. 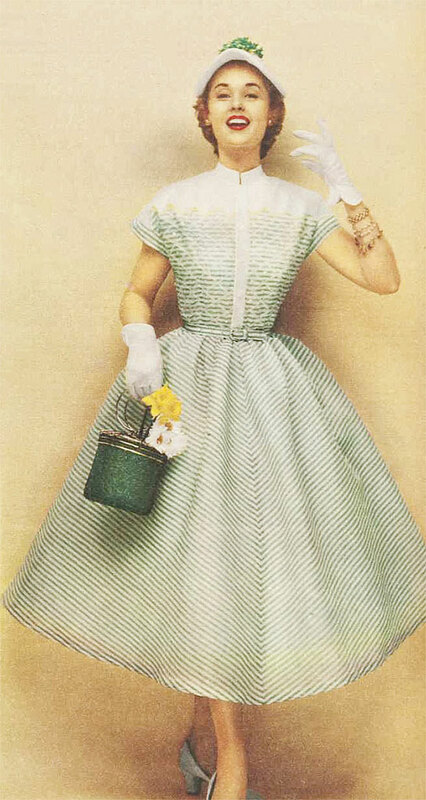 Dresses with flowing, bright colored skirts became the standard for suburban housewives. For working women, the much more form-fitting knee-length pencil skirt was often worn, requiring a tight girdle in order to emphasize the hourglass figure. For men, 1950s fashion was not very different from that of previous decades. Men often wore suits, sweaters, casual button-downs, and slacks, all made of similar fabrics. Unlike in the 1920s, men avoided patterns, opting instead for solid colors. In the U.S., the 1960s was defined by the rise of counterculture movements that revolutionized social norms across the country. Youth culture during the 1960s rejected the emphasis on conformity that the preceding decade ingrained in society. 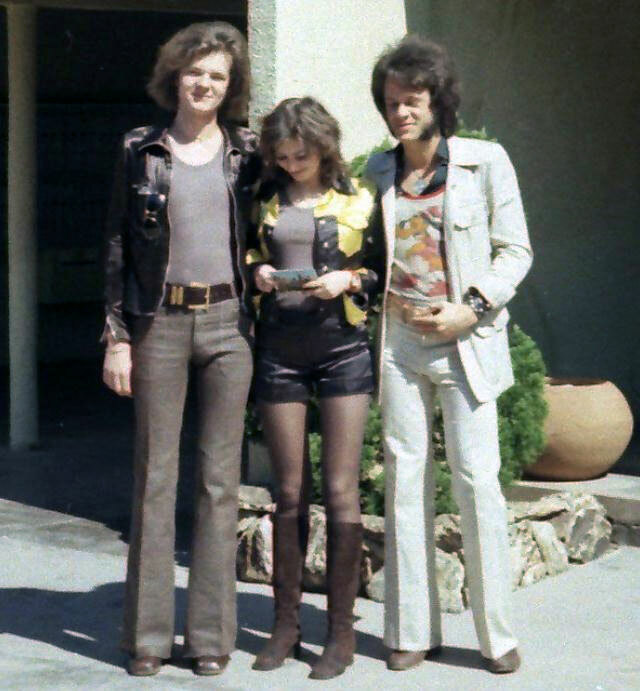 Replacing distinct separations between the styles of clothing worn by men and women, the 1960’s introduced a new phenomena: unisex clothing such as denim jeans and leather jackets that could be worn by everyone. Originating in London, Mod fashion quickly reached the U.S. by the mid-1960s. Defined by bright colors and bold geometric shapes, Mod fashion became prominent amongst the affluent youth in the United States. Rejecting the popularity of the Mod look, “Greasers” emerged across the country, challenging the colorful fashions established by Mods. 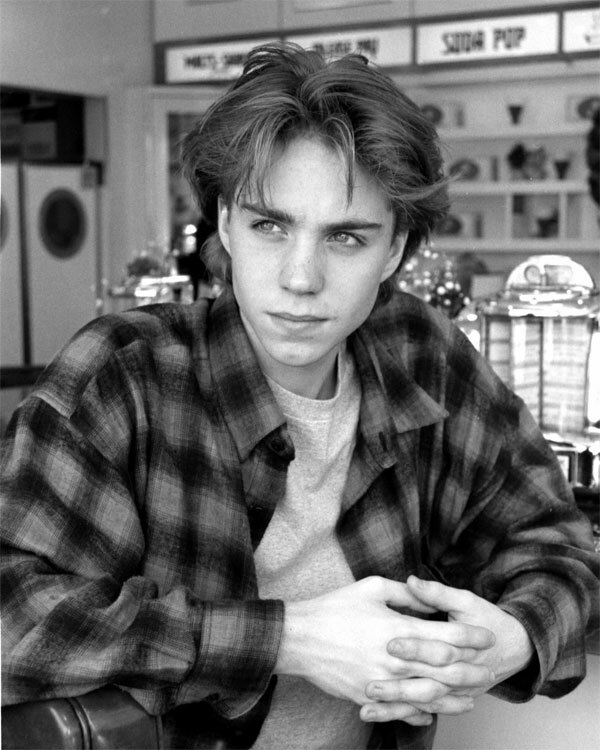 Greasers, whose name derived as a result of their greased-back hairstyle, were a working class subgroup of youth that originated in the 1950s but gained popularity in the following decade. Greasers are known for popularizing the leather jacket as casual, which was previously worn by military pilots. In addition, they often wore tight fitting T-shirts and distressed jeans. The Hippie counterculture movement emerged in California during the late 1960’s, spreading quickly to the East Coast, particularly to Greenwich Village in New York City. The Hippie revolution was kicked off following the Summer of Love in 1967, a socio-political phenomenon when nearly 100,000 people gathered in San Francisco, inspiring social change and the acceptance of different lifestyles. 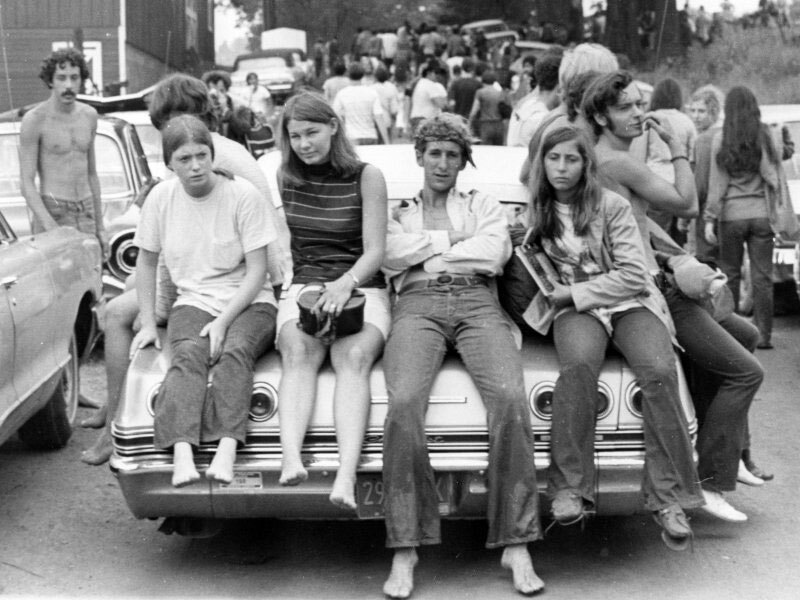 Rebelling against consumerism, most hippies wore handmade clothing and accessories. Long maxi skirts and bell-bottomed jeans gained popularity along with floral patterns, bright tie-dyes, and paisley patterns. Women rejected the girdles and padded brassieres that were encouraged in the 1950s, replacing them with unconventional practices such as avoiding make-up and sporting long, unkempt hair. Setting the precedence for change and modernity, the youth counterculture movements of the 1960s allowed for fashion trends to flourish in the 1970’s. But unlike the in the 1960s, Americans in the 1970s took a step back from political movements, choosing instead to focus on themselves. Many have referred to this shift as a “return to normalcy”, giving the 1970s its nickname as the “Me” Decade. Having been introduced in the previous decade, unisex clothing became the norm by the early 1970s. With women entering the workforce more than ever before, pantsuits and daywear with a masculine edge were popularized among youth. Women also wore skirts in a variety of lengths, often opting for tight-fitting mini skirts for everyday wear. Popularized in the late 1960s, hot pants, tight-fitting shorts with an inseam length of 2-3 inches, became a fashion go-to for young women during the first half of the 1970s. Tight tops and loose-fitting bottoms defined fashion for both men and women during the latter half of the decade. Becoming a wardrobe staple in the 1970s, blue jeans were worn by men, women, and children across the country, coming in a variety of different styles. The popularity of bell-bottoms continued and today, the style has become representative of the decade. Women often opted for ankle-length maxi skirts and dresses with long slits on the sides that reached the thigh. Bold patterns were popular among both genders along with sports jackets, chunky sweaters, and pleated pants. Fashion in the early 1980s was similar to that of the 1970s. But by 1984, pop stars such as Madonna and Cyndi Lauper brought a new sense of style to the decade, one that focused on pushing boundaries with creative patterns, funky color combinations, and unique styles. Women began sporting skin-tight cotton leggings, pairing them with chunky sweaters and oversized, off-the-shoulder tops. In addition, young women also wore loose-fitting parachute pants topped with figure hugging crop tops that stopped just above the belly button. Layered clothing also gained popularity. For example, mini skirts, made of either denim or spandex, were often paired with leggings or legwarmers. Accessories were a huge staple during this period, particularly for teenagers and young adults. Women often wore brightly-colored glasses, several chunky bangles, and giant hoop earrings for casual wear. Hair was often permed to achieve high volume and makeup featured bold eyeshadow, heavy foundation, and bright lipstick. For working professional women, the 1980s brought about a new phenomenon: power dressing. Finding its origins in the 1970s, power dressing gained prominence in the early 1980s and refers to a fashion style used by working women to establish authority in their professional environments. By the 1980s, the idea of women in the workplace had become the norm; however, women still felt the urge to establish equality in the professional world, using fashion as their weapon of choice. Power dressing called for pairing tailored blazers complete with shoulder pads and fitted knee-length skirt. Shying away from the tightly fitted clothing of the 1970s, men in the 80s opted for loose and comfortable fabrics. Activewear was a popular choice among young men, combining sweatpants and sweatshirts with sneakers. By the late 1980s, Nike had skyrocketed to worldwide success thanks to the popularity of athletic wear among men. When compared to the flashy style of the 80s, fashion in the 90s took a much more minimalist approach. Adults of the early 1990s wore relaxed fit jeans with plain T-shirts and knit sweaters while teenage and pre-teen girls often opted for brightly-colored neon clothing: hot pinks, greens, blues, oranges, and yellows. By 1992, these fluorescent colors were replaced by softer shades: coral, turquoise, lilac, and more. With the rise of popstar MC Hammer came the beginning of the parachute pants, relaxed-fit pants made of cotton complete with tapered legs and a drawstring waist. Comfort became the emphasis for Americans during the decade, rejecting the uncomfortable clothing trends of the previous decade. By 1992, grunge music reached unprecedented popularity among the youth, bringing with it a new fashion trend that would define the decade. Brightly colored clothing took the back seat to plaid flannel shirts, stonewashed jeans, and dark colors like maroon, gray, forest green, and brown. In the U.S., grunge fashion popularized Doc Martens, a British footwear brand whose black leather boots became a staple among the country’s youth. By 1995, wide leg jeans of the 1970s were revived along with the advent of chunky black boots and the baby doll t-shirt, popular among young women and teenage girls. Punk and alternative styles became a part of mainstream fashion in 1996, bringing with it short, spiky hair, black clothing, and skater shoes. For young women, the late 90s fashion was defined by the spaghetti strap tank top and the skort (half skirt, half shorts). Capri pants, a tapered pant that ends at mid-calf, and low-rise jeans were also popular. Crop tops from the 80s continued to be worn by most young women along with tapered, high-waisted pants. Based on the hairstyle of Jennifer Aniston in the popular 90s TV show Friends, the “Rachel” haircut became popular among young women during the latter half of the decade. Around the same time, feathered bangs also rose to popularity as well as the pixie cut. Following the 1990s, fashion in the 2000s moved away from the minimalist approach, incorporating the fusion of trends from several different styles. By the early 2000s, designers began incorporating more color and pattern into their clothing, using inspiration from vintage clothing of the 1960s, 1970s, and 1980s. Women's fashion took a more feminine turn as women began wearing denim miniskirts and jackets, halter tops, belly shirts, low-rise jeans, and capri pants. During the mid 2000s, the tunic dress gained popularity among young women and teenagers, often paired with a thin belt at the waist. By 2007, ballet flats had become a staple in women's fashion, along with sweater dresses and long button-down shirts. Men's fashion during this decade resembled that of the 1980s, incorporating athletic attire into everyday wear. Men wore sneakers, baseball caps, and sweatshirts, pairing them with bootcut jeans. The 2000s saw a revival of 1960s style as more and more men began sporting black leather jackets, motorcycle boots, and Ed Hardy T-shirts as well as accessories. Working men during the 2000s often opted for slim fitting pants topped with two-buttoned blazer jackets, a button-down shirt, and a thin tie. During the latter half of the 2000s, men began sporting tighter fitting clothing than ever before.